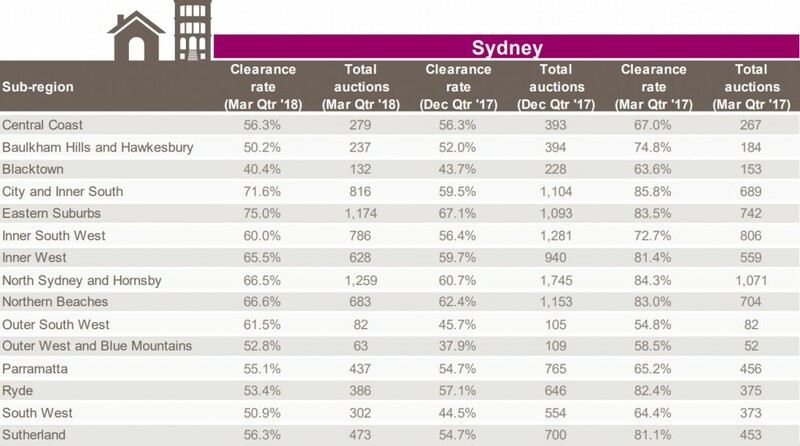 Clearance rates increased across all but two capital cities over the March quarter, with Sydney recording the largest increase, up from 57.7 per cent to 63.6 per cent. Perth and Tasmania were the only areas where clearance rates fell, with Perth down -5.0 per cent and Tasmania -6.4 per cent across a lower volume of auctions over the quarter. Melbourne recorded the highest clearance rate at 68.4 per cent, up from 68.1 per cent the previous quarter, followed by Canberra at 67.9 per cent. Although the combined capital city clearance rate increased over the March quarter, if we compare the latest figures to March 2017, the clearance rate has fallen 10.2 per cent, while auction volumes have increased by 1,460 across the combined capital cities. Auction volumes fell over the March quarter which is expected given the auction market doesn’t usually pick up until early February, although the week ending 25th March recorded the highest auction volumes on record with 3,990 homes taken to auction across the combined capital cities. Melbourne was the busiest auction market with 9,488 homes taken to auction over the quarter, followed by Sydney with 7,755 scheduled auctions. 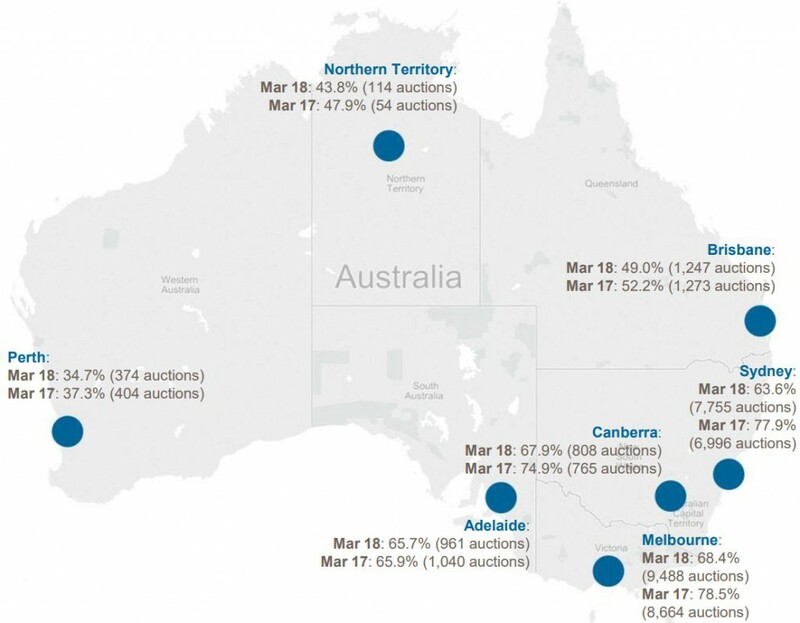 Across the smaller auction markets, Brisbane was host to the highest volume of auctions over the quarter (1,247), followed by Adelaide (961) and Canberra (808). 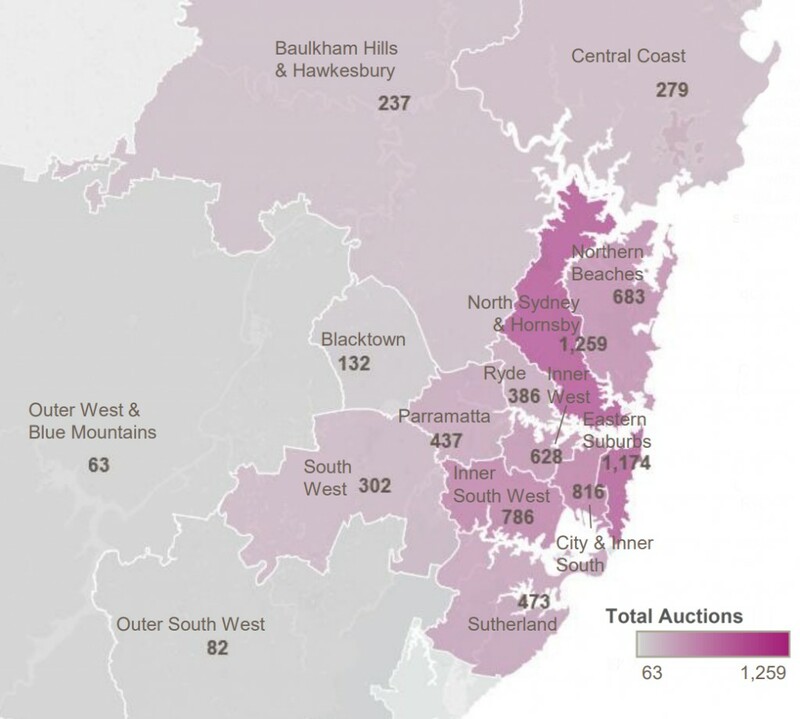 Across Sydney’s sub-regions, the Eastern Suburbs was the only region to see an increase in auction volumes over the quarter with an additional 81 homes taken to auction, returning the strongest clearance rate of all 15 sub-regions (75.0 per cent). North Sydney and Hornsby was the busiest sub-region this quarter with 1,259 homes taken to auction, followed by the Eastern Suburbs, while the quietest sub-regions were the Outer West and Blue Mountains (63) and Outer South West (82). Clearance rates increased across 11 of the 15 sub-regions over the March quarter, while remaining unchanged across the Central Coast, and falling across Ryde (-3.8 per cent), Blacktown (-3.4 per cent) and Baulkham Hills and Hawkesbury (-1.8 per cent). Overall, the clearance rate for Sydney increased from 57.7 per cent to 63.6 per cent over the March quarter, while there were 3,497 fewer homes taken to auction across the city. Includes suburbs where at least 20 auction results were reported over the three month period noting that clearance rates are calculated based on total auction results collected rather than total auctions held.